Bruno Benedetto Rossi was born on April 13, 1905 in Venice, Italy. His father, Rino, was an electrical engineer and had taken part in the electrification of Venice. Rossi was educated at home until he was 14, after which he attended ginasio (gymnasium) and liceo (high school) in Venice. He began his university studies at the University of Padua and finished his laurea (doctorate) at the University of Bologna in 1927. In 1928 Rossi took a job as an assistant at the Physics Institute of the University of Florence. Initially Rossi was at a loss to find a project to work on with the limited resources of the institute, but after reading a paper on cosmic rays, Rossi began studying them and developed an improved instrument, called a coincidence circuit, allowing him to study them. The instrument consisted of two Geiger counters, one mounted above the other, where metal plates could be inserted in between. By varying the type and thickness of the metal plates Bruno could determine the penetrating power of the cosmic rays. Cosmic rays are charged atomic particles that bombard the Earth originating from the supernovas of large stars and in smaller amounts from active galactic centers. The surface of the Earth is protected from these charged particles by the Earth's atmosphere and magnetic field, although some reach the Earth's surface. Life on Earth would not survive were it not for this protection. Initially these particles were believed to be a form of electromagnetic radiation, but in 1927 Jacob Clay measured the amount of rays detected as he voyaged from Netherlands to Java and reported that the amount of rays hitting the Earth's surface changed with latitude with a minimum at the equator. This demonstrated that the "rays" were not photons and must be charged particles that were deflected by the Earth's magnetic field. In 1932 Rossi became a professor of experimental physics at the University of Padua. In 1938 he was dismissed from his professorship because he was Jewish. After a brief stays at the Bohr Institute in Copenhagen and University of Manchester, Rossi emigrated to the United States where he took a position at Cornell University in 1940. In 1943 Rossie joined the Manhattan Project in Los Alamos, New Mexico where he was co-chair, with Hans Straub, of the "detector group", which was responsible for designing detectors used by the scientists developing the atomic bomb. 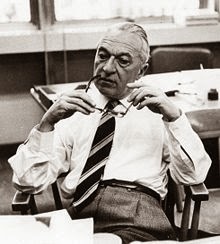 In 1946 Rossi took a professorship at the Massachusetts Institute of Technology at the new Laboratory of Nuclear Science. At MIT Rossi focused on studying newly discovered subatomic particles. Rossi focused on developing detectors that could be launched into space to study cosmic rays that are not affected by the Earth's atmosphere and magnetic field. Rossi retired in 1970, but continued teaching. Awards won by Rossi include the Rumford Prize from the American Academy of Arts and Sciences (1976), the Elliot Cresson Medal from the Franklin Institute (1974) and the National Medal of Science (1985). Rossi was also awarded honorary doctorates from the Universities of Palermo, Durham, and Chicago. Rossi died on November 21, 1993, suffering a cardiac arrest.